Hillary Clinton Rolls Out 5-Point Plan to Combat Radicalization in the U.S.
Democratic presidential frontrunner Hillary Clinton unveiled a five-part plan to thwart the growing threat of domestic terrorism in the U.S. on Tuesday. Clinton spoke at the University of Minnesota’s campus in Minneapolis, saying the San Bernardino massacre has shaken Americans, CBS News reports. 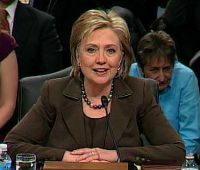 Clinton’s strategy largely focuses on shuttering the online recruiting and training systems used by ISIS by increasing intelligence sharing and carefully vetting social media sites. Clinton proposed sending agents to “high risk countries” to “better investigate” visa applicants. Posted: 12/16/15 at 9:24 AM under News Story.